Molly Bloom’s Irish Bar and Restaurant. 2391 S. El Camino Real, San Clemente. 949.218.0120. www.mollybloomspub.com. It’s not uncommon for foodies and food professionals to order a dish at a restaurant without knowing exactly what it is. It is, however, uncommon to finish the plate clean and still be unsure of what you ate. Now that doesn’t sound like a ringing endorsement, but it is. It’s like if you went fishing in a small mountain brook for trout and you reeled in a whole rotisserie pig—you can’t explain what just happened, but you’re ecstatic. That’s Molly Bloom’s corned beef boxty—the rotisserie pig of mountain brooks. It’s large chunks of herby corned beef, pickled cabbage and hot mustard, wrapped in a potato pancake. And if you’re thinking a crispy latke potato pancake, think again. It’s a doughy, not too sweet, legitimate pancake. The corned beef is tender and moist, and spiced warmly with something like fennel or anise. The cabbage is just crisp enough and adds its characteristic earth tones and bite to the dish. The spicy mustard, which passes through the nostrils like air in a breezeway, provides the perfect amount of moisture and adds necessary complexity about halfway through the boxty. And then there’s the pancake, which retains its integrity throughout the meal and serves as a capable vessel for the other elements on the plate. It’s the busiest week at Irish pubs across the country, and Molly Bloom’s will likely be no different. 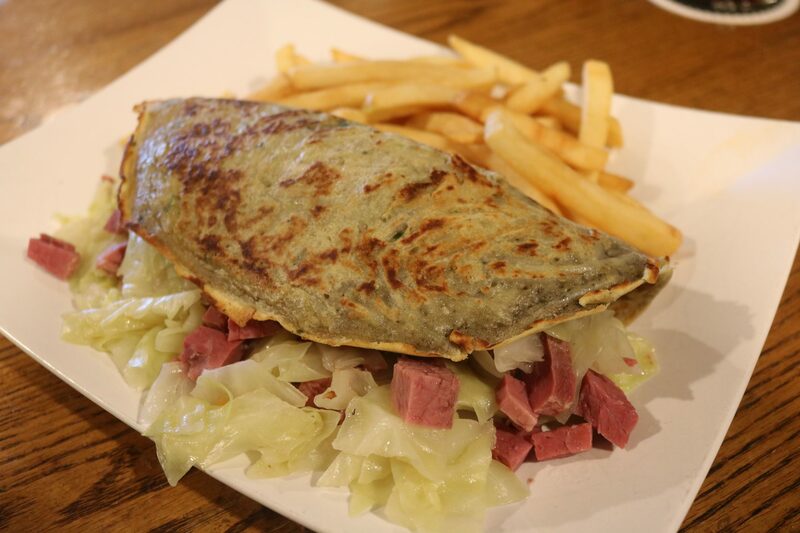 Corned beef and cabbage will enjoy its annual pilgrimage to the top of the food world, and with it, the perfect ridiculousness of the boxty will get its moment in the sun.